That’s the number of people using ad blocking companies around the world. According to PageFair’s 2016 Mobile Ad Blocking Report, 159 million of these ad blockers are in China, 122 in India, and 14 million are in Europe and North America. But when you bring desktop into the mix, the ad blocking trend becomes even scarier, creating an even greater need for ad blocking solutions. 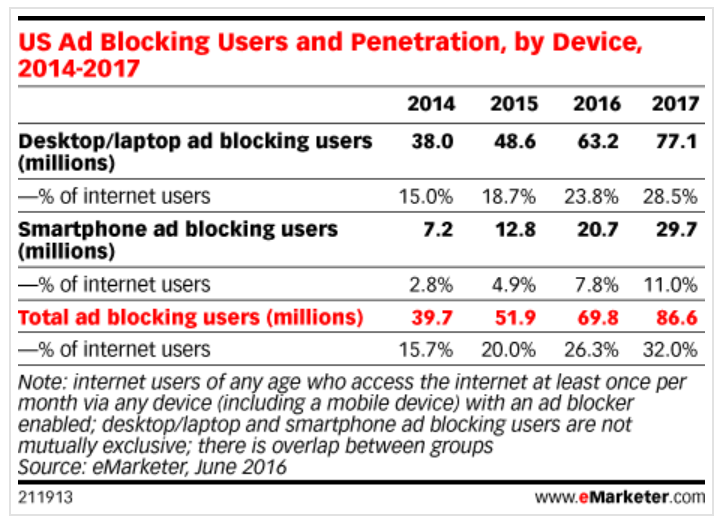 According to eMarketer, more than 1 in 5 people in the United States is expected to use ad blocking companies by 2017. But premium publishers are fighting back. According to PageFair, the ad blocking trend is costing publishers $21.8 billion in lost revenue. In turn, that threatens publishers’ ability to provide free content, reports BBC. To fight this, BBC reports that premium publishers are getting creative. According to BBC, the UK business newspaper CityA.M refuses access to people who try to read the site using ad blockers, men’s magazine GQ charges for access if you use ad blockers, and business magazine Forbes tries to find a compromise. Basically, Forbes promises ad blocking readers that they’ll get “an ‘ad-light’ experience” if they turn off the blockers, reports BBC. “If readers comply, Forbes says, they will be shown no welcome ad, no video ads inserted between paragraphs, and no ads between posts. If they don’t, they will be denied access to the site’s content,” reports BBC. According to Digiday, even in Turkey, where ad blocking “is still below 10% ‘psychological’ threshold,” publishers are taking action in preparation. Starting in 2016, Turkish media company Dogan TV Holding is offering a paid subscription option, where people can watch video content without ads. A new threat from companies ad blocking in 2017? But this isn’t all the news coming from Europe on the ad blocking front. Not only will companies ad blocking in 2017 continue to cut into publishers’ ad revenue – there’s a chance they’ll cut into their subscription revenue as well. Or at least that’s what popular ad blocking company Adblock Plus is trying to do, as it partners with the Swedish micropayment company Flattr to create a browser extension called Falttr Plus. According to Digiday, Flattr Plus browser allows users to “specify how much money they want to pay each month to their favorite sites. The browser extension runs in the background and distributes that budget to the sites readers are most ‘engaged’ with” – assuming those sites have signed up as partners, that is. All content creators can sign up, but if a user chose your publication and you haven’t signed up, you won’t get the payment until you join. According to Business Insider, critics in the advertising industry are seeing AdBblock Plus as an unethical, blackmailing company. Till Faida, owner of Adblock Plus, told Business Insider that the 500 million people who downloaded Adblock Plus “want to support online content creators, but are fed up of ‘aggressive’ advertising.” He said his goal “is to reach 10 million users [each one paying an average of $5/month] – compensating content creators $500 million”. The ad blocking trend is clear – publishers will continue to face an uphill battle in 2017. This continuous trend is concerning, but knowledge is power. Keep reading, as we’ll also offer solutions. 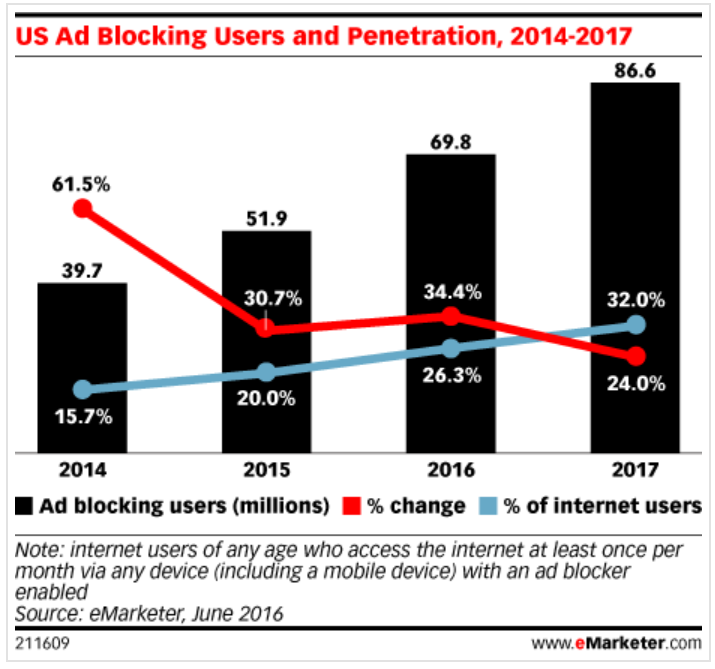 According to eMarketer, ad blocking usage in the US grew by 34.4% in 2016 versus 2015, and is expected to expand by another 24% in 2017, reaching 86.6 million people. Sourcepoint’s State of Ad Blocking 2015 research showed that, while all ages and segments of the population use ad blocking companies, the most dominant users are from the youngest population – a trend that’s bound to continue into 2017 with the increase of mobile ad blocking. eMarketer explained that “users spend most of their mobile Internet time” in apps, where ad blockers don’t work as much, but “the number of people using smartphone ad blockers will jump 62.3%” by 2017. With multiple companies serving this market, expect the trend to experience significant growth in 2017. In an Internet Advertising Bureau (IAB) UK study, 56% of respondents “were not aware that blocking ads meant that websites would lose revenue”, but “even with the knowledge that ads fund content,” people would still use ad blockers. The New Economy reports that this understanding didn’t make much impact on people’s willingness to pay for an ad-free content experience either. Only 4% said they’d be willing to do that. 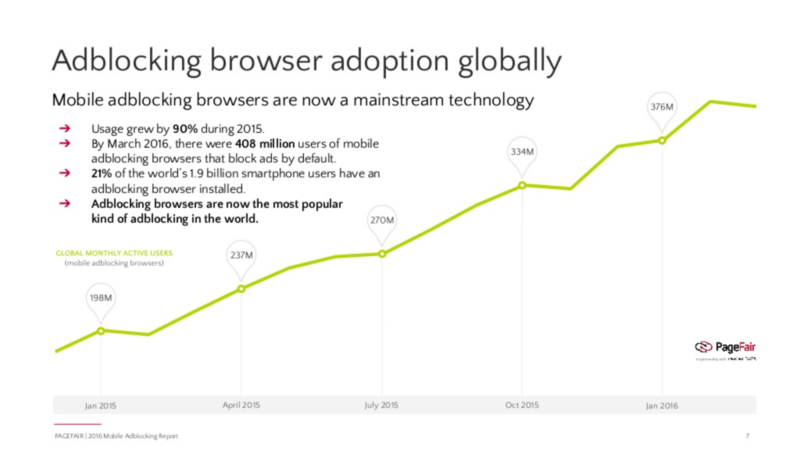 With the expansion of ad blocking options, users will keep resisting payment. 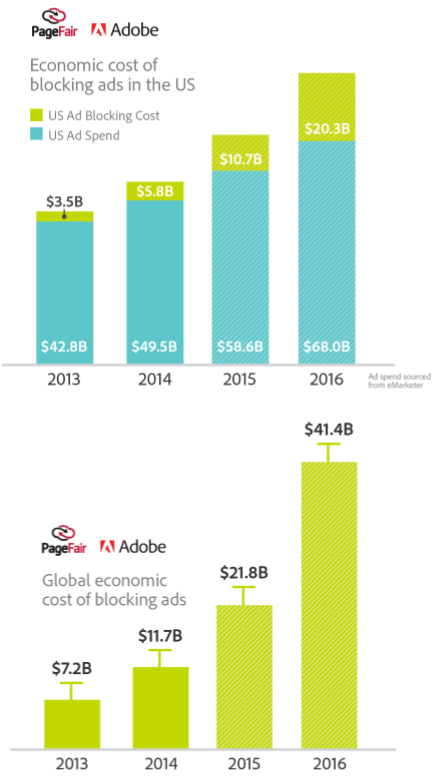 According to a 2015 report by PageFair and Adobe, the global economic cost of ad blocking was $21.8 billion in 2015. Publishers will see an increase in costs this coming year, but there’s hope: sometimes predictions are wrong. In 2017, some premium publishers will finally stop fighting users and start listening. According to the IAB UK study, “people are blocking ads because they find them intrusive.” Ads, as they are today, slow down the sites and interrupt people’s experiences. “The first rule… is to respect the user and offer a quality, uncluttered experience,” IAB UK reminds publishers. In 2017, premium publishers will provide better ad experiences, that people actually want to consume, leading with better native ads, including in-image advertising. Companies countering ad blocking have been around for several years, and as the pressure rises on publishers, the demand for these companies’ products could increase exponentially. Smart publishers will choose their partners carefully, to ensure that how they deal with ad blocking works in the best interest of advertisers and the end target audience, or the solutions they’ll adopt will backfire. For your convenience, we’ve created a list of a companies countering ad blocking that provide the top ad blocking solutions you should be paying attention to in 2017. The gap it fills in the market: Ad blocking is caused because of user experience, privacy and speed challenges, but instead of helping publishers overcome these challenges and serve their audiences better, ad blockers come between publishers and their audiences. How it solves the problem: Like all smart companies countering ad blocking, PageFair understands the way to make a difference is to listen to everyone’s needs and find win-win solutions. Therefore, PageFair helps publishers improve the issues mentioned above, so advertisers don’t have as much competition on each page and users have less clutter. Plus, PageFair enables them to use first party data and create a premium sector for readers who are willing to pay for content. The numbers: 10.5+ billion page loads measured across the Web in the last 30 days, 16% of the ComScore top 50 media companies use PageFair, 198 million users of desktop ad blocking, 17 employees. The gap it fills in the market: There is a big miscommunication regarding the value of content, and how publishers should be compensated for producing it. How it solves the problem: Sourcepoint helps publishers trigger messages that clarify there’s going to be a value exchange when people consume content, and let each user choose whether she prefers a free, ad-based experience, or another way to compensate the publisher. The numbers: 4 offices in 2 continents, 24 employees. The gap it fills in the market: Ad supported content has a lot of advantages – mainly, making it easy for 3 billion global Internet users to access information. But the attempt to monetize content has come with consequences at the expense of this audience – their privacy has been threatened, their experience cluttered with intrusive ads. So the audience blocks these ads, and nothing changes on the publisher and advertiser sides. How it solves the problem: Secret Media restores blocked ad impressions, especially video ad impressions, and offers analytics that help publishers develop a better user experience around the ads. The numbers: 2 types of ads recovered (video and display), 2 offices in 2 continents, 13 employees. Free training from Secret Media: Secret Media offers several research papers here. Yes, that’s us! We wanted to introduce ourselves to readers who might not know much about us. The gap it fills in the market: Pages with visuals convert better on websites, because humans react to and retain visual information better than they do plain text. People are not likely to want to block images from articles they read, opening a great opportunity to counter ad blocking, yet only 0.1% of all online images are being monetized. How it solves the problem: Our company offers mobile-friendly in-image ads that ensure a great user experience for readers. We also use big data, plus contextual and behavioral analysis, to ensure that all the ads we serve are relevant to our users – and therefore helpful instead of a nuisance. The numbers: 800 million monetized images, 13,000 publishers, 22 billion impressions, 20+ countries, 53 employees. 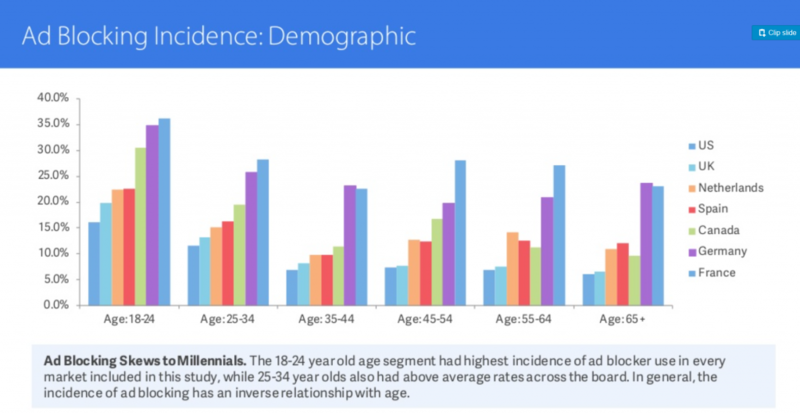 The gap it fills in the market: One top reason people are blocking ads is that publishers have gotten them used to poor quality ad experience. As a result, ad blockers are asking advertisers to meet certain standards and pay a fee if they want their ads whitelisted and displayed. Google also has a personal gap here – having to pay $25-50 million a year to Adblock Plus in order to get its ads whitelisted, reports AdExchanger. How it solves the problem: Google might be a surprising addition to the list of companies countering ad blocking, but as a large, influential ad network, Google has a big stake in this market. According to AdExchanger, Google already allows users to say which ads they want to see while using Google’s products, and it provides guidelines for what’s an acceptable ad. Its intention is to now create an industry-wide program for online advertising standards, so that users will actually want to see ads. The numbers: 96% of company revenue comes from AdWords, 59-61% average cost per acquisition on AdWords, $51.81 billion global net ad revenue from 2015, 30% share of global ad revenue in 2015, 71,690 employees. 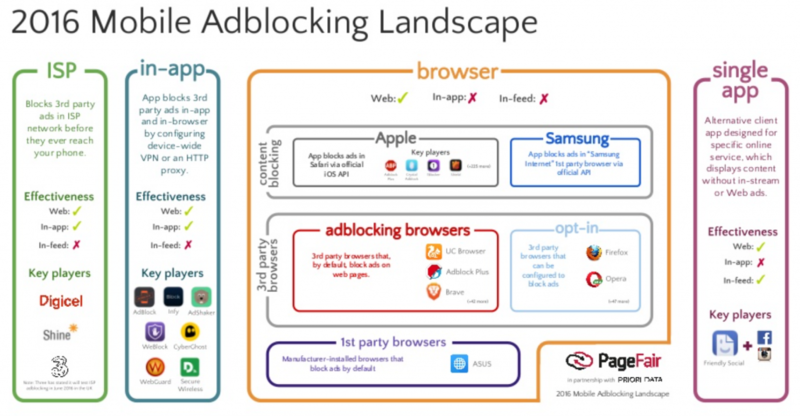 Overcoming ad blocking won’t be easy. It might still cut into your revenue in the new year. But now is the time to brainstorm, choose a strategy, and test it, so you can gradually optimize it. You’ll be much better off when 2018 comes along if you start now. I never realized before the extent of ad blocking. Interesting article and solutions.